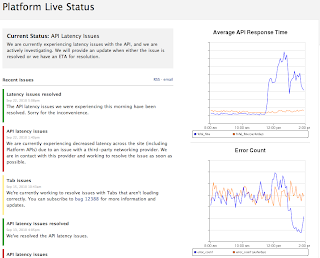 "Almost three years ago, I started blogging about the importance of transparency at my blog Transparent Uptime. I chronicled the benefits of being transparent in your companies handling of downtime and performance. I did case studies on transparency done right, and transparency done wrong. I spoke at conferences preaching the gospel of performance. What was a strange idea back then is now becoming obvious, especially to young companies. Just as things were ramping up, I was forced to put my blog on hiatus. In the time since, I’ve been looking for someone to hand off the torch of transparency to. I’m really excited to be a part of the launch of Transparent Performance, a new online consortium that will bring together experts from around the industry to continue the transparency movement. Transparency isn’t about altruism, or being “good”. Transparency is good business decision. My hope is that Transparent Performance can help the industry cross the chasm, and make it both obvious and trivial to be transparent in your uptime and performance. If anyone can do it, these guys can. And if you’re interested in becoming a contributing editor too, do drop them a line or comment below." Everyone that still follows this blog, or stumbles across this post, do yourself a favor and go to Transparent Performance. I'm a bit late to the story (something called a day job getting in the way!) 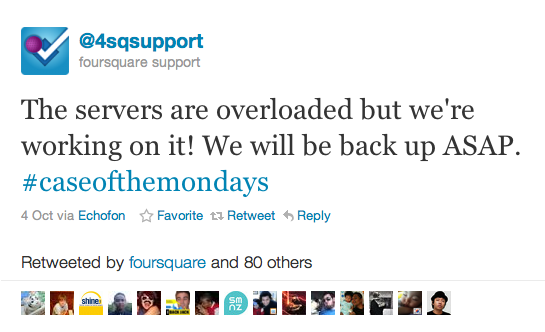 but I can't pass up an opportunity to discuss how Facebook handled the "worst outage [they've] had in over four years". 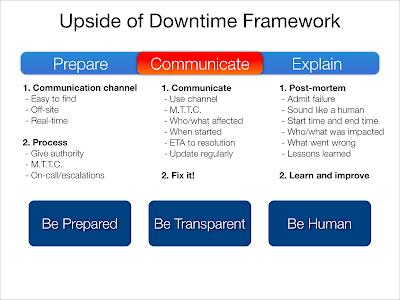 I blogged about the intra-incident communication the day they had the outage, so let's review the postmortem that came out after they had recovered, and how they handled the downtime as a whole. Prepare: Much room for improvement. 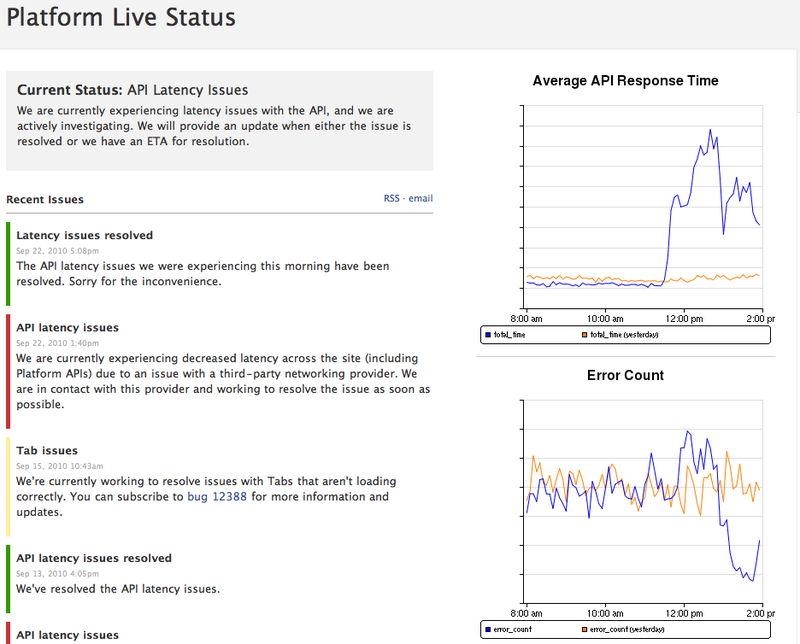 The health status feed is hard to find for the average user/developer, and the information was limited. On the plus side, it exists. 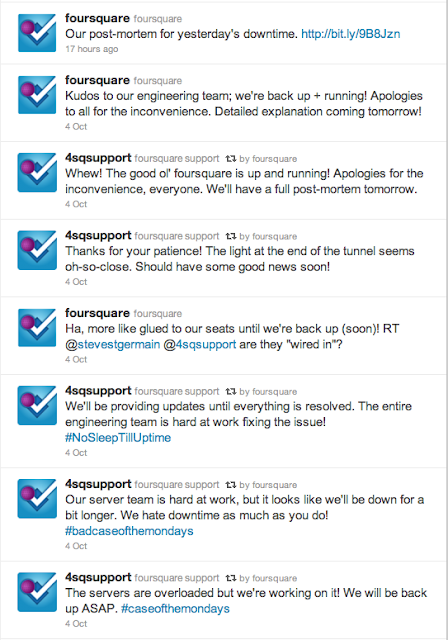 Twitter was also used to communicate updates, but again the information was limited. Communicate: Without a strong foundation create by the Prepare step, you don't have much opportunity to excel at the Communicate step. There was an opportunity to use the basic communication channels they had in place (status feed, twitter) more effectively by communicating throughout the incident, with more actionable information, but alas this was not the case. Instead, there was mass speculation about the root cause and the severity. That is exactly what you want to strive to avoid. Admit failure - Excellent, almost a textbook admittance without hedging or blaming. Sound like a human - Well done. Posted from Director of Engineering at Facebook Robert Johnson's personal account, the tone and style was personal and effective. Have a communication channel - Can be improved greatly. Making the existing health status page easier to find, more public, and more useful would help in all future incidents. I've covered how Facebook can improve this page in a previous post. Above all else, be authentic - No issues here. Start time and end time of the incident - Missing. Who/what was impacted - Partial. I can understand this being difficult in the case of Facebook, but I would have liked to see more specifics around how many many users were affected. On one hand this is a global consumer service that may not be critical to people's lives. On the other hand though, if you treat your users with respect, they'll reward you for it. What went wrong - Well done, maybe the best part of the postmortem. Lessons learned - Partial. It sounds like many lessons were certainly learned, but they weren't directly shared. I'd love to know what the "design patterns of other systems at Facebook that deal more gracefully with feedback loops and transient spikes" look like. 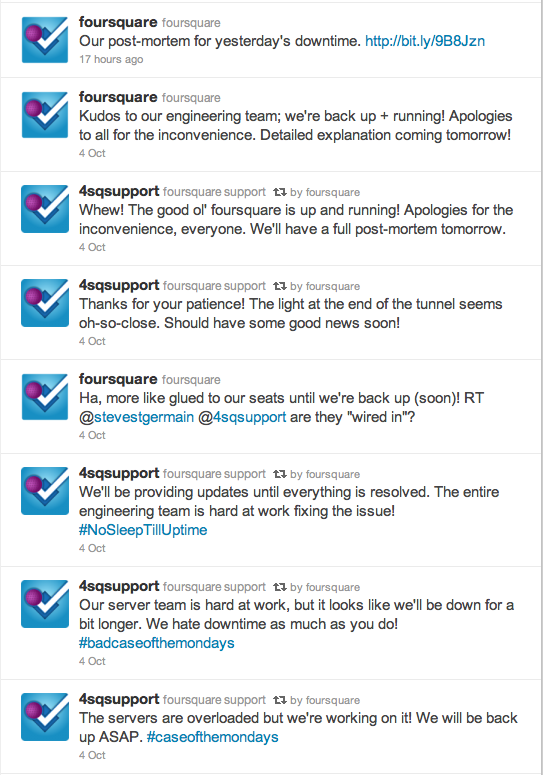 Biggest lesson for us to take away: Preparation is key to successfully managing outages, and using them to build trust with your users. "The short story: This morning at 2:54 am PDT Twitter was notified of a security exploit that surfaced about a half hour before that, and we immediately went to work on fixing it. By 7:00 am PDT, the primary issue was solved. 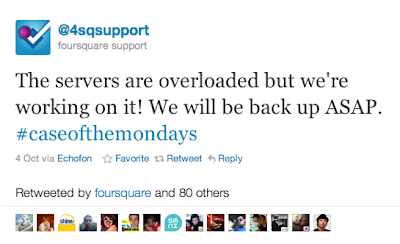 And, by 9:15 am PDT, a more minor but related issue tied to hovercards was also fixed." We discovered and patched this issue last month. However, a recent site update (unrelated to new Twitter) unknowingly resurfaced it. Early this morning, a user noticed the security hole and took advantage of it on Twitter.com. First, someone created an account that exploited the issue by turning tweets different colors and causing a pop-up box with text to appear when someone hovered over the link in the Tweet. This is why folks are referring to this an “onMouseOver” flaw -- the exploit occurred when someone moused over a link. Other users took this one step further and added code that caused people to retweet the original Tweet without their knowledge. This exploit affected Twitter.com and did not impact our mobile web site or our mobile applications. The vast majority of exploits related to this incident fell under the prank or promotional categories. Users may still see strange retweets in their timelines caused by the exploit. However, we are not aware of any issues related to it that would cause harm to computers or their accounts. And, there is no need to change passwords because user account information was not compromised through this exploit. We’re not only focused on quickly resolving exploits when they surface but also on identifying possible vulnerabilities beforehand. This issue is now resolved. We apologize to those who may have encountered it.